This morning when I walked towards the office, I had to pause and look at a sight that I had almost forgotten was inevitable. It was a lone yellow leaf on the ground. I looked up at the tree and I could have sworn it was green yesterday. The first day of Autumn (September 22) is approaching, but I guess my tree already knew that. 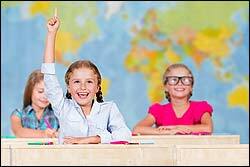 Are you in Back to School Mode? Whether you have children in the house or not, fall's routine can feel more demanding than summer's. Perhaps the shorter days may make it feel as if you have less time to accomplish things in any given day, perhaps the pace of people around us speeds up. Regardless of the reason, take a moment everyday to relax and breathe. While the immediate effect may not be obvious, stress and oral health are related. Stress may contribute to grinding and clenching teeth, canker sores, gum disease and loose teeth. We suggest starting your day off with a heathy breakfast and thinking positively about the day ahead while you brush and floss your teeth. This will give you a few minutes to yourself as well help to ward off some of the effects of stress on your oral health. If you are looking for something with minimal stress to do with family or friends, apple and pear picking season is back. Freshly picked fruits make a great snack and can often be stored for making pies, treats and meals that will remind you of your adventure to the farm. Our team underwent their yearly renewal of their CPR training in August. 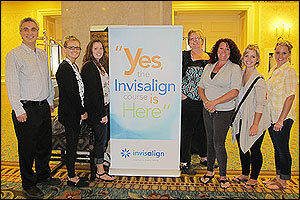 On Friday September 7, Dr. Benedict and his team attended Invisalign training at the Fairmont Royal York in Toronto. Dr. Benedict is thrilled to offer Invisalign treatment. Invisalign creates custom fitted removable trays which are changed about every two weeks, progressively straightening, aligning and improving your smile. See more photos here. Please call our office to book a complimentary consultation. School is back in session, make sure you have the best smile for photo day! Port Hope Dental is offering a special teeth whitening promotion from September 1, 2012 – October 31, 2012. REV Whitening (take home) is $199 (regularly $350). Required to have dental exam including necessary X-rays. For more details call our office. Dr Jordan Benedict is pleased to present the donation to Paul Allen, Member of Northumberland Sports Council accepting on behalf of KidSport Northumberland. Thanks again to all that participated in our annual sports mouthguard clinic, ensuring more Northumberland kids will get to stay active and healthy! How to Prevent Tooth Decay! Tooth decay describes the break down of strong healthy teeth over time. Your tooth's surface is composed of a hard mineral coating called enamel. Enamel is the hardest tissue in your body, but by no means indestructible. Your teeth are exposed to bacteria all day which produce plaque. Plaque is the substance that covers your teeth and eats away at the enamel causing the holes known as cavities. Brushing your teeth twice daily, flossing and regular professional cleanings with your hygenist will help keep plaque under control and prevent tooth decay. Leaving plaque on your teeth leads to tartar buildup which brushing and flossing alone can not remove. Letting plaque get out of control can lead to many oral problems ranging from bad breath and cavities to gum recession, periodontal disease and tooth loss. Even teeth with fillings aren't immune to plaque. Plaque is acidic and may damage fillings and other dental work leading to future problems. Under your enamel is a layer of the tooth made of dentin. Dentin is high in mineral content, but much softer and more vulnerable to decay. Once a cavity has reached this layer it starts effecting blood vessels and eventually the root. This is why dentists often fill small cavities long before they reach a level where they become problematic (ie. root canal). Click here to learn how to prevent tooth decay! This month we have a delicious recipe that's perfect for a quick and easy school night dinner and will also be great to use up turkey leftovers at Thanksgiving. It is a Thanksgiving Shepherd's Pie compliments of Julia Mason, the Coordinator of the PC Cooking School at Loblaws Bowmanville.